A by-product from my texturing and baking experiments for the Sketchfab Texturing Challenge, based on Venus de Milo (Aphrodite of Milos) (274k tris) from the SMK museum, and inspired from engine9’s model. Remeshed to a smooth mesh with MMGS, then to a lower reolution one (7.6k tris) with blender decimate modifier. The normals were baked from the high poly version to the low poly one. 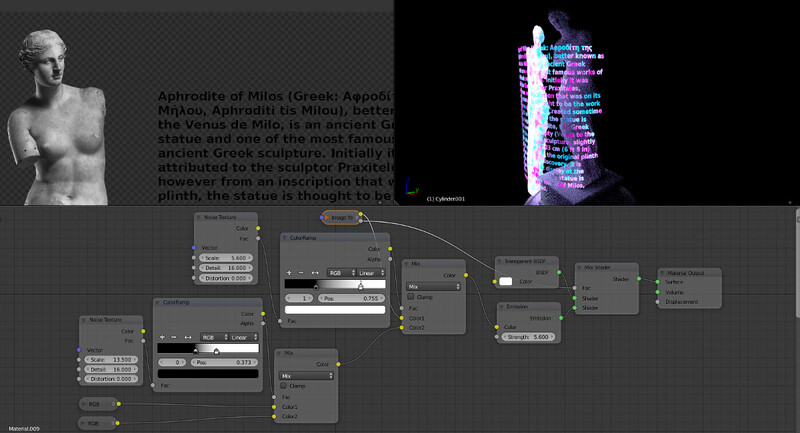 A simple emissive/transparent material was added to the dome around the statue, taking as input the statue and text image and mixing emissive colors based on noise textues. The resulting lighting was baked in blender and is applied as an emission texture on the objects, which works quite well and looks convincing with the Queen Mary Chimney as an environment texture!